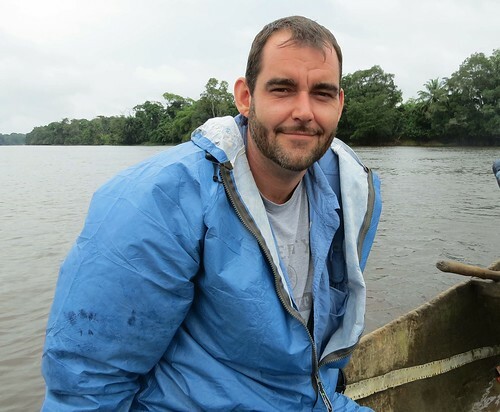 What brought Steven to Yawende in the Lomami Basin. My first real view of the N’Djili International Airport after the brief, disorienting excitement of my arrival in Kinshasa, DR Congo, was watching a plane take off. The medium sized, twin prop cargo plane arched into the sky; black, billowing smoke poured out of both engines as it slowly gained altitude and disappeared into the horizon. I watched the event unfold from the window of a car – the same car that would minutes later, drop me off to catch my own flight to Kisangani and into the heart of the country. The sprawling mass of the capital city rushed past my window, colourful, crowded poverty, hardly the country’s ‘crown jewel.’ I had a rare moment to simply sit and reflect, letting the saturation of sounds and sights sink in. I asked myself what I have asked myself numerous times in numerous developing countries across the world: how on Earth did I get here? For the first time I had an answer: I was here for a purpose and in order to fulfill that purpose, I would have to be ready for anything the DR Congo was prepared to throw at me. 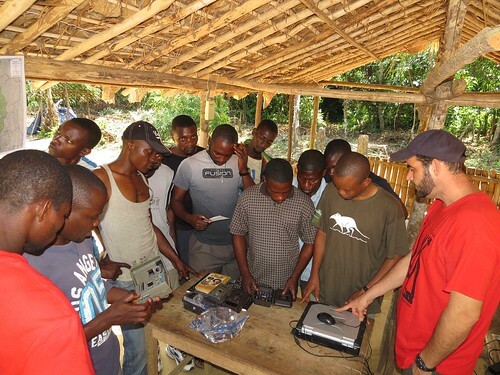 Steven giving preliminary training in the use of camera traps to the TL2 team at the basecamp in Lohumonoko village. A week earlier, I had the first of many sit down sessions with John and Terese Hart in their home and base of operations for the TL2 project. What had started out as a thesis topic from my advisor, Dr. Kate Detwiler of Florida Atlantic University’s Anthropology Department, had now turned into a reality. I outlined plans and methods for studying the new, cryptic species of monkey, lesula. John constantly added new ideas with the unique perspective that only comes with decades of hands-on research experience. After a week of late nights and early mornings, the 2013 Lesula Project was slowly taking form. I had brought with me 21 new camera traps with another 27 being added to the project from the completed Bili survey in the north. A crew of 12 of the foundation’s finest was being assembled in Kisangani, all traveling from far and wide in preparation for the start of the project. After 12 months of planning and preparation for this moment, it was about to begin. 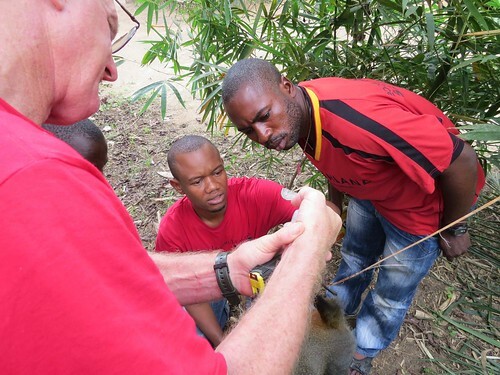 John weighing a hunter-caught lesula with Pablo and Bravo (far right) looking on. John and I flew to the regional capital of Kisangani to begin the logistical preparations for the project, thankfully, on a more reputable airline than the one I had seen take off earlier. We spent nine days at the project’s, dilapidated but delightful way-house just off the banks of the Congo River. Slowly, over the course of the next few days, I began to meet the team that would prove to be pivotal to the success of our project. Pablo Ayali was first. Language was an issue for me here. My French was non-existent, a side effect of having lived in the Spanish-driven South Florida region for the last decade. Pablo would quickly become my right-hand man and translator, facilitating the transition of my ideas into reality. I met the charismatic Ephrem Mpaka next, then somber looking, but very funny Bravo Bofenda. These three men, along with Louison Bakatunga, who I would meet later at the field site, would make the core of the project team. They never ceased to amaze me with their skill and love of the forest. 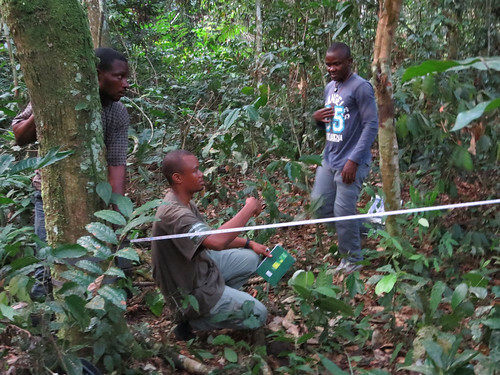 From left to right, Louison, Pablo and Ephrem measuring out a grid on the Okulu study site. Three days after departing Kisangani, tired and unimaginably sore from a 350 km trek down a mostly one-rut footpath on the back of a motorbike, Pablo and I reached Yawende, a small, isolated group of villages bordering Lomami National Park. All along the way members of the TL2/Lukuru staff met us, expediting our transition from one stage of our journey to the next with speed, graciousness and excited smiles. The chaos and disorderly nature of the Congo came at us as rough roads, uncooperative weather and innumerable DGM Immigration Officials; all were no match for the experienced field staff. Also, along the way, I got to meet village and district chiefs and local people who were excited about the conservation work being done in their backyards. As soon as I spoke the word lesula, there would always be an excited chatter in Lingala. I quickly realized that this primate was a point of particular pride for the locals, almost more so than all the other high-profile species present in the area. Lesulu mother with juvenile caught on one of the Okulu camera traps. With a small geographical range of 17,000 km2, lesula was found only there in the forest blocks to the west of the Lomami River. The discovery of lesula had brought the world’s attention on their home and they were happy to talk about their newly famous primate. About this time, the reality of life in the DR Congo began to sink in: things run slowly here and every task, no matter how small requires gargantuan quantities of patience and adaptability. Detailed schedules and precise control over situations were fuzzy memories from a far, distant life. John had again joined us in Yawende after finalizing the remaining details of supply shipments. For the next 10 days we sat down and picked apart the basic premises of our methodology, rigorously reviewed assumptions about equipment and restructured the experimental design of the project to best get answers to the questions we were asking. It was an immensely enjoyable time for me to see the power of collaborative science and grass-roots conservation in action. John was truly a master of both, and I soaked in as much as I could during our exchanges, as I was to take the reins after his departure. Captive juvenile lesula at one of the Yawende villages next to the base camp at Lohumonoko. After John left in early October, we loaded up all our equipment. 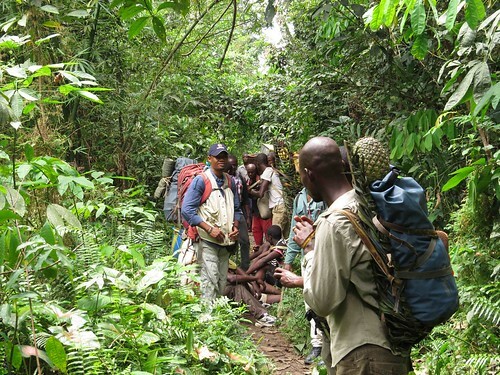 The winding, single-file convoy of 18 people and supplies began the long 20 km walk from the basecamp, through the forest and into the selected study area. A rest along the way to Okulu camp. We set up camp on the banks of the Okulu River and immediately began the laborious task of prepping the 2 x 2 km grid for study. We cut 20 km of transects by hand over the course of the next week and set 41 camera traps, all programmed for video capture, inside the study area. During our prep work, we were doing daily, pre-dawn vocalization surveys to assess and identify the primates present in the area. 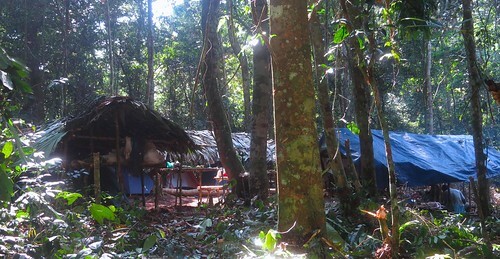 The Okulu Research camp from which Steven and his team patrolled the forest and camera traps. We encountered many signs of hunting during our set up, including an abandoned hunting camp on the path between Camp Okulu and the study area. We could hear lesula’s dawn boom echoing out of the forest, but we quickly realised that the impact of human hunting was having a startling effect on this forest site. 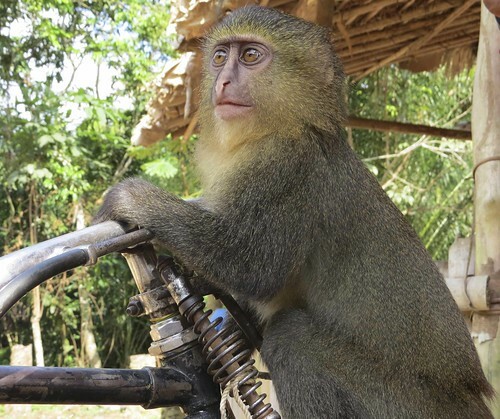 A question that we wanted to answer: how is hunting affecting this little known primate species? We knew they thrived in the remote, lightly hunted interior of the park, but this would be the first time the species had been studied at a heavily hunted site. Hunter marching past a camera trap with his bagged monkey — a guenon, probably mitis. After the camera traps were set, we waited. I was nervous, not knowing what the cameras were going to pick up. We busied ourselves with the tasks at hand: vocal surveys, transects, sample collection from hunters. A lot was being accomplished, however, our collective thoughts were focused on the camera traps. If the study area had been hunted out, and we got no videos, what then would our next move be? Lesula was out there, but how many? The study area was sparsely populated with fauna and much more heavily hunted than I had anticipated with entire days of walking through the grid without seeing a single animal; most notably, we had not spotted a single wild lesula in the forest since our arrival. Lesula with infant on the Okulu study area. Two weeks after we set the camera traps, Pablo and Ephrem collected our first set of video data from the field. They took the memory cards from two experimental cameras that we had set just outside the southern border of the grid. What we found on the memory cards was remarkable: clear, high quality videos of duikers, African civets, ratels (honey badgers), aardvarks and, of course, lesula – lots and lots of lesula. I spent the rest of my time in the Yawende forest refining the project based on new information. Videos were coming in with leopards, golden cats, crowned eagles, red river hogs, and many, many more species, with each video capturing a wide range of behavior that was not possible with still photos alone. The team had become very skilled. We were able to troubleshoot problems before they arose and execute multiple lines of data collection simultaneously, each team member knowing their role and performing each of their assigned jobs tirelessly. By the time my window in the Congo was coming to a close, I had full confidence that the work we were doing there was groundbreaking. I was tired, sore and emotionally drained from the isolation of the bush, but I felt sad that I had to go – I wasn’t quite ready. As we packed up camp and headed back to the village for what would be my final time, I glanced over my shoulder and took one last look at Camp Okulu. The team would return in a few days and continue the survey for another month, but I would not. 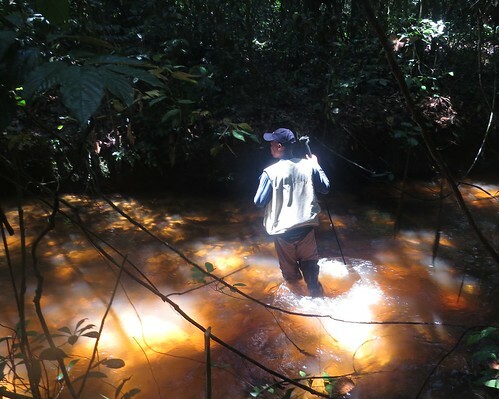 I was heading home with a hard-drive of data and the memories of being a part of a collaboration that did something truly amazing in the remote forests of the Congo River Basin. Steven in the dugout ferry crossing the Lomami River. It took me two weeks from that last glance back at Camp Okulu before I arrived home. As I began to pour through the data, one thing became abundantly clear. All the species in the heavily hunted Yawende forest had undergone a radical reduction in population size. The story, like so many others coming out of the rainforests of Central Africa was the same: the impact of human hunting was having a severe, deleterious effect on the endemic and threatened species present. However, out of the sadness of reality, a small ray of light has emerged. Lesula, the mysterious, newly added member of our primate family, appears to be doing just fine coping with the human threat. Their shy, cryptic behavior looks as if it is – for now – buffering them from the major impact of hunting. Although much more research is needed on this exceptional species and the unique ecosystem in which it lives, we can take some small pleasure in lesula’s resiliency. In a discipline that is dominated by tragic losses, we might have stumbled across one of the rare, good news stories in primate conservation. This entry was written by Terese Hart, posted on 2014-03-19 at 10:10 pm, filed under About the project, Mystery monkeys. Bookmark the permalink. Follow any comments here with the RSS feed for this post. Post a comment or leave a trackback: Trackback URL. keep up with your outstanding work. The Democratic Republic of Congo and the forest people do need your help. They just do not know yet that. Exceptional video capture!!! Well done to you and the team. Wonderful to read about all the different species captured on the camera traps and heartening to know so much wildlife still remains. Also really interesting that Lesula were captured so frequently on the cams, are they quite a terrestrial species? In the photo of the hunter, the monkey is C mitis haymensi. Also I am very interested to see all that blue on the back side of the leusla mom…Not as large a patch as on the adult males, but still very prominent. This is another feature that separates them from C hamlyni, where females do not have a blue behind. We did not recognize that in the original description. And it makes it makes the function of this colored patch all the more of an intriguing question. Thank you Steven for sharing this, and great to see this as I prepare to join Pablo at Losekola for the comparative survey there. Nice article and beautiful footage of the lesula. So good to see that Ephrem and Bravo are continuing their forest work (I worked with them at Bili in 2012).